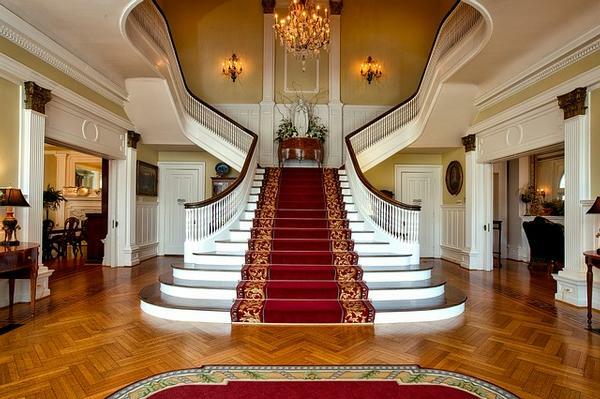 Installing hardwood floors or upgrading your property’s flooring and concerned about the staircase transition? 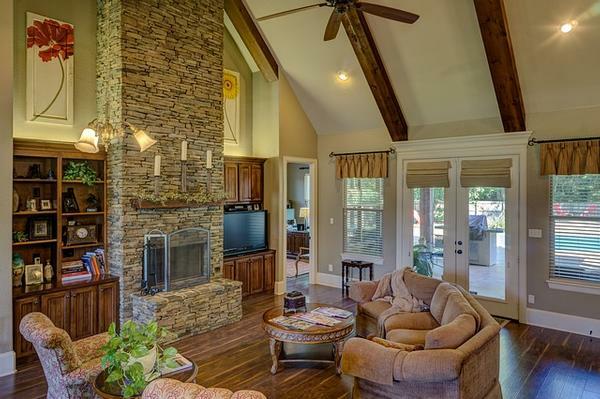 Need to create a new design or look inside your home? Want to add value for your property? Hoping to complete something that will last an entire lifetime? Look no further than creating a custom hardwood flooring surface staircase to enhance the aesthetics and appeal of your home. The seemingly endless advantages of hardwood floors are capable of extending to other levels in your home with the implementation of a custom built wooden staircase. Not only can the woodworking be used for the steps, but railings, banisters, and pickets - if desired, can also be stained to match or reflect a specific color desired for you, the homeowner. If you have a unique space or area in need of an upgrade from the current traffic pattern of stairs, then consider installing a custom built unit for your home. Depending on the space and functionality, there are a variety of different design components which can be implemented in order to ensure your finished product really makes an impact. The shear range in types of stairs that can be built varies considerably. Depending on the transition from one level to the next inside (or outside) your home, one of these should work for you. Not only will you get to design how the stairs move from level to level but also the details involved throughout the process. 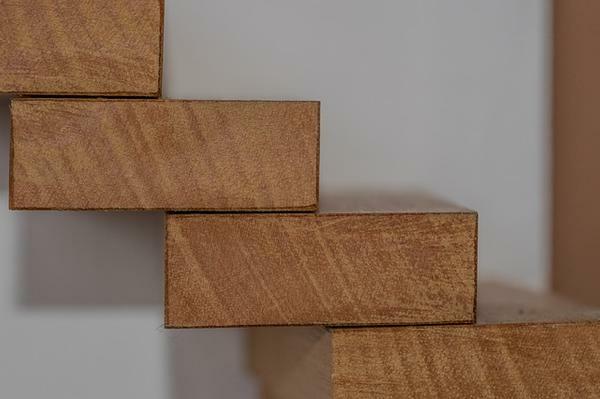 Depending on how your stairs are built - either up against an existing wall, floating, or expanding down as they lower - the results are entirely up to you. Also involved will be the railings and banisters which can be anything from a simple wooden post to an extravagantly designed column. Whatever the look and feel you desire to achieve, it can be granted with a custom designed staircase. Hardwood floors will last a lifetime with proper care and maintenance, which extends to the staircase as well. A known high traffic area, serving as the means of transportation from one level to the next inside a home, getting the most durability is a key feature. By utilizing a hardwood design, the stairs will last forever with proper care, no matter the amount of traffic they endure. If you’re considering a change in flooring surface types, hoping to get the most out of your home and staircase, or ready to discuss options about having hardwood floors repaired or refinished then look no further than TGB Flooring. Our professionally trained employees have a wealth of experience, can assist with the specifics of which factors will influence any addition to your home, and can help in determining the best aesthetically pleasing color scheme for any room in your house. Serving the Denver and surrounding areas since 1990, TGB will provide assistance in selecting the appropriate look, feel, and direction for your space while providing hands on experience and explanations about the work that you want completed. Contact us today at 303-738-9910 to schedule your free estimate to get started. Hardwood floors are one of the most versatile types of flooring that any homeowner can install. Not only do these surfaces last a lifetime but they are extremely design friendly, durable, and able to withstand considerable amounts of traffic. They will last, but hardwood floors are also an economical option and one that can cut down on the amount of allergens in a home. Instead of having plush carpet to regularly trap dirt and debris, hardwood floors are a solid surface that can be cleaned easily. These flooring types are one of the best around but there is one nemesis to the overall ability of its functionality - water. Left unattended, water can cause considerable damage to anything and hardwood floors are no different. If your home has been subject to any of the following types of combinations with water and your flooring surface, then appropriate action is needed to immediately remedy the potential for severe damage. Hardwood floors are resilient and can withstand most minor accidents or occurrences with a simple spill. Whether a glass of water or wine - which typically won’t stain a hardwood surface as opposed to carpet - a quick drying and removal of the liquid should be enough to keep your flooring surface looking good and undamaged from the spill. 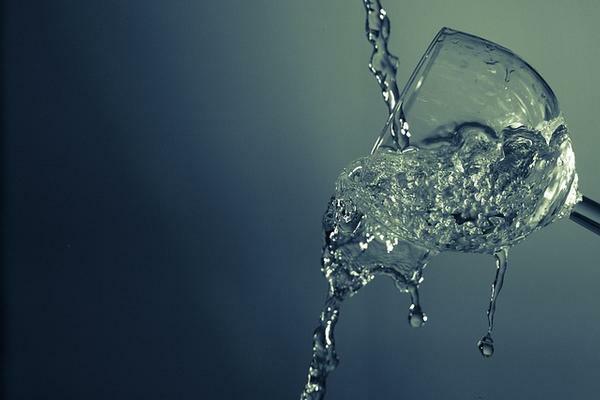 Consider leaks as an extended spill but instead of immediately trying to dry the area, locating the cause of the water is critical. For instance, if you have a water leak under the kitchen sink and it’s beginning to flow out and onto the hardwood floors, then shutting off the water to that area of the home should be step one. Once complete, then the same drying procedures for spills can be implemented with the possible addition of a fan or hair dryer being used to further dry an area that has been exposed to a considerable amount of water. Timing is everything, and the quicker you can remove the water from contact with the hardwoods, the better your chance at keeping them in place without much repair needed. A flood is an entirely different animal but again the timing and amount of water to which the floors have been exposed will determine the availability of salvage or replacement. Saving hardwood floors from flood water damage is possible but immediate action must be taken to remove the water entirely. Depending on the cause of the flood and if conditions even warrant this opportunity, the removal process may be delayed. If so, quickly assessing the situation when possible and determining the appropriate measures needed can help to determine what is best for your hardwood floors following a natural disaster. If you’ve experienced some water damage or are ready to discuss options about having hardwood floors installed, repaired, or refinished then look no further than TGB Flooring. Our professionally trained employees have a wealth of experience, can assist with the specifics of which factors will influence any addition to your home, and can help in determining the best aesthetically pleasing color scheme for any room in your house. Serving the Denver and surrounding areas since 1990, TGB will provide assistance in selecting the appropriate look, feel, and direction for your space while providing hands on experience and explanations about the work that you want completed. Contact us today at 303-738-9910 to schedule your free estimate to get started. Expecting? Many soon-to-be parents, especially first timers, immediately go into over protective mode for their child. While this isn’t necessarily a bad thing, there are some instances in which parents need to be a little more cautious although extreme measures are not necessary. One of those is with the flooring surfaces throughout your home - specifically, hardwood floors. Hardwood floors are elegant and extremely durable but may be a bit rough for newborns as they begin to crawl and walk. The smooth surface can be difficult to gain traction for babies, in addition to being a harder surface when falls occur. However, if your home is currently equipped with hardwoods, then there is no reason to panic. Instead of ripping out a solid investment option, consider each of the following to help pave the way for your new child. 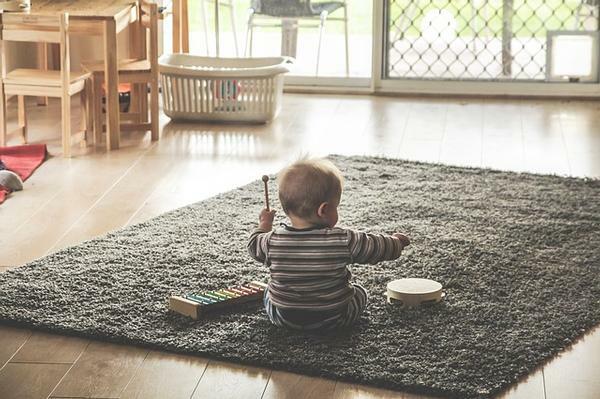 In large open spaces such as the dining room or living room, area rugs can serve to provide a nice plush play area for the child. Instead of having increased amounts of solid wood showing, the rugs can assist in the decor process while allowing for a safe play environment. Area rugs also provide a two-way street for homeowners, parents, and baby. Not only do they serve to help protect the child but they also benefit the parents by protecting the hardwood floors once the child is old enough to play. Another option for parents to consider are foam squares which interlock to form a mat and can be used easily throughout the home. These interlocking squares for kids and babies are soft, durable, and help to create a safe play area for little ones. They are also easily put down and removed, making them ideal for quickly creating a safe play space in any area of the home. Quickly and efficiently applied on top of the existing hardwood floors, these interlocking squares come in a variety of different shapes and sizes. Any parent should be able to find what they need for a nursery, living room, or any other space in the home. Carpet runners placed in high traffic areas not only serve to protect your hardwood floors but they can also make nice “runways” for baby once he or she is mobile. Whether crawling or walking, these long, plush pieces will help eliminate any bruising which could occur from continuously moving about on hardwood surfaces. If you’re ready to discuss options about child-proofing your floors or even having hardwood floors installed, repaired, or refinished then look no further than TGB Flooring. Our professionally trained employees have a wealth of experience, can assist with the specifics of which factors will influence any addition to your home, and can help in determining the best aesthetically pleasing color scheme for any room in your house. Serving the Denver and surrounding areas since 1990, TGB will provide assistance in selecting the appropriate look, feel, and direction for your space while providing hands on experience and explanations about the work that you want completed. Contact us today at 303-738-9910 to schedule your free estimate to get started. Congratulations, you’ve made nearly every decision associated with hardwood flooring for your installation or complete repair. Wood types and lengths have been analyzed, colors and stains have been sampled and ultimately, you feel the hardwood floors about to be installed are going to truly change the look and feel of your home. You’d be right, but there is one other important factor to consider when implementing a hardwood flooring surface that you may have forgotten. Which direction do you want these hardwood floors to flow and if any edges are used, should it change or continue in the same pattern? This is important and definitely something to consider and discuss with professionals prior to beginning the process. You’ll want to consider where furniture will be, how the wood may transition to hallways and other rooms in the house, in addition to what is going to create the best look for your home. Often, the correct direction for laying hardwood floors revolves around the main entrance and creating a good flow to the home. By running the boards longways from the doorway all the way into and throughout the home, the flow and openness desired from implementing hardwood floors can be achieved. If ran counter to the doorway, it almost creates a blockage as the boards would be in line with the wall instead of perpendicular to the entrance. By utilizing the flowing method, a warm and inviting floor pattern is achieved. However, there are exceptions to utilizing the most common method and depending on your unique situation, a quality look can still be achieved. The house layout and design itself plays a significant factor in determining which direction your boards should be installed. If you own a ranch style home then the front entrance may lead to a hallway and if implemented to flow from the doorway into the back of the home, an entire hallway may be divided into tiny cross-sections, instead of long boards that would extend throughout the length of the space. Two things can be done to combat this occurrence. Either the boards run the length of the hall throughout the main level to create the flow down and into the other areas of the home - even if it counters from the inviting doorway method, or a transition may be installed and the wood can change direction once it reaches the hallway area. In this instance, the boards would flow from the main entrance and perhaps into one or two rooms and then change direction when it meets with the hallway. Another exception would be if the homeowner determines to use a hardwood floor inlay. At this point, the selected design would then predict board direction when the two meet where installed. When you’re ready to make a decision on hardwood floor installation, repair, or refinishing then look no further than TGB Flooring. Our professionally trained employees have a wealth of experience, can assist with the specifics of which factors will influence any addition to your home, and can help in determining the best aesthetically pleasing color scheme for any room in your house. Serving the Denver and surrounding areas since 1990, TGB will provide assistance in selecting the appropriate look, feel, and direction for your space while providing hands on experience and explanations about the work that you want completed. Contact us today at 303-738-9910 to schedule your free estimate to get started. Baseboard color in a home is often an afterthought but can serve a variety of intended purposes if styled correctly. While many people don’t notice the use or color scheme, a well executed plan can help to create an impact when making the decision after installing or deciding to paint the transition piece. Used in conjunction with the wall, the baseboard allows for different types of floors to be installed without leaving unfinished areas around the wall connection. If not used, then the walls would have to be installed over top of the floors after completion and any changes would be near impossible without complete removal. The baseboard adaptation creates a gap which not only helps with humidity and the expansion or contraction process in reliance to the weather, but also serves as a vital construction component inside the home. There are essentially three main options when choosing a color for your baseboard and shoe mold pieces. A traditional one color approach that matches everything else throughout the home for a sense of flow or choosing to finish out the baseboard in the same stain as the hardwood floor or color of the wall. Most homes use a traditional one color approach and typically that is white. A white baseboard fits nicely no matter the carpet/wood floor coloring or wall hue. No matter what color you make base molding, a white border often matches windows and door trims which are also used throughout the home. No matter what color your walls and floors, the white brings everything together and creates a sense of flow throughout the different rooms, even if colored separately. While there are a wide array of baseboard styles to choose from, electing the color is something different entirely. By choosing to match the baseboard with the wall, it creates a focus on the floor and while there won’t be a contrast at the intersection, the wall will flow entirely onto the floor. Depending on the color shade, this in itself could create a unique blend and nice feel to the room. Another option is to have the baseboard match the floor and then begin the wall color. This is especially effective in helping smaller rooms feel larger. By extending the floor color up onto the wall, the perception is that the floor extends beyond its limitations. While effective with both carpet and hardwoods, traditionally this approach is only taken when the color doesn’t result in a sharp change from one surface to the next. When you’re ready to make a decision on baseboard colors after having hardwood floors installed, repaired, or refinished then look no further than TGB Flooring. Our professionally trained employees have a wealth of experience, can assist with the specifics of which factors will influence any addition to your home, and can help in determining the best aesthetically pleasing color scheme for any room in your house. Serving the Denver and surrounding areas since 1990, TGB will provide assistance in selecting the appropriate look, feel, and direction for your space while providing hands on experience and explanations about the work that you want completed. Contact us today at 303-738-9910 to schedule your free estimate to get started.